Nearly 15 years ago, Mark W. had perhaps the worst towing experience of his life. Pulling a borrowed pop-up camper with his ‘03 Chevy Tahoe on his way down to Florida, the trip should have been a piece of cake. Instead, his camper rocked the whole vehicle, which caused a seesaw effect so terrible that all passengers became car sick. Mark is from North Carolina, close to Fort Bragg, so he and his family typically take trips over to the beaches on the North Carolina coast with their toy hauler, packed up with motorcycles and scuba gear. These trips range from 2-4 hours and can cover up to 200 miles, but they do occasionally head on longer trips south. As a guy who, along with his wife, is a Dive Master, being able to travel safely and comfortably to dive destinations is a must – they’ve already been down to Destin and Key West in Florida and have gone scuba diving in the Keys, but they have dreams of a lengthy trip to explore the Lower 48 states and Alaska in their RV. In order to be able to take this dream trip one day, Mark knew that first he’d have to find a solution to his towing nightmare. In the fall of 2016, Mark and his wife made the decision to buy their own RV – a 36-foot Forest River toy hauler, weighing in at 10,000 lbs. fully loaded. Knowing what happened with the borrowed pop-up, they knew that they were going to have to find an air suspension solution to make towing easier. At the time, he had a 2016 Ford F-150 Lariat Crew cab, all the truck he could possibly need to get the job done. 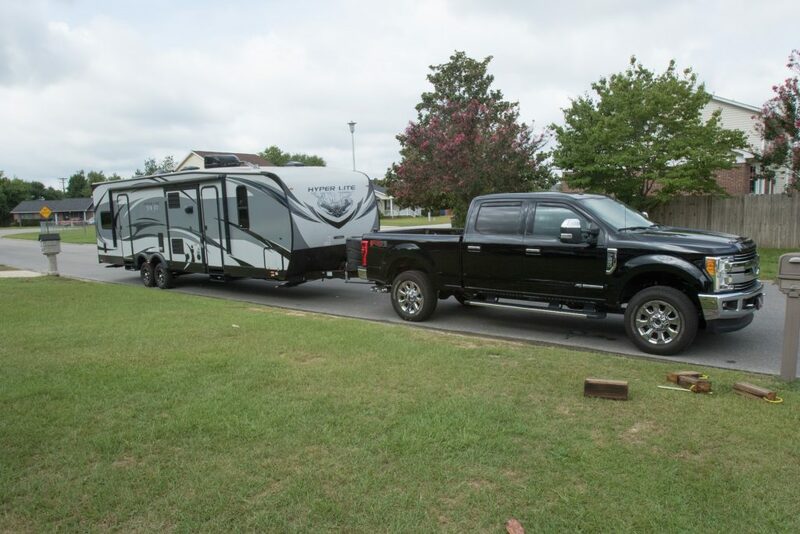 In order to ensure that his towing experience was safer and his ride quality was restored, Mark purchased the LoadLifter 5000 Ultimate from Air Lift, and paired it with the WirelessAir compressor system. After having the system installed by a local installer, he immediately noticed a difference – a safer, and more comfortable ride, with no bottoming out. When Mark upgraded his truck to a 2017 Ford F-250, he switched over his WirelessAir system and purchased a new set of air springs from Air Lift – opting to go for the LoadLifter 5000 Ultimate PLUS, which had upgraded components like stainless steel roll plates and braided, stainless steel air line. For his second install, he opted to do it himself, with the help of his son and a friend. With a borrowed pair of floor jacks and a few hours on the weekend, Mark started on the installation process. “The overall installation of the air bags, air compressor, and module system was fairly straightforward and not hard at all,” Mark says. With the help of Air Lift’s fully-illustrated installation guide, Mark was able to get his air springs installed with no problems. Installing his WirelessAir system came with a few roadblocks. Mark really wanted to mount the compressor in a location that would keep the interior of the cab completely free from any compressor noise. In order to do this, he had to place the system components further back on the vehicle frame than recommended, which forced him to do a few extra modifications to the mounting hardware and to the fuse box. With a little help from Air Lift’s Customer Service team and their YouTube channel, Mark had his new system up and running in one weekend. “I was taking my time reading the instructions and making strategic decisions on where to install the compressor and why,” Mark said. Since installing his second set of air springs, Mark and his family have spent a week on the beach at Marine Corps base Camp LeJune in North Carolina. 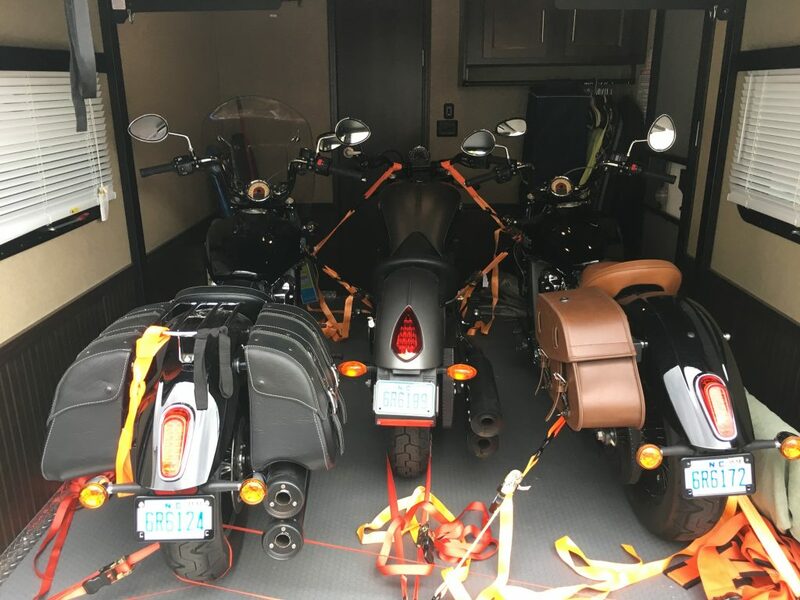 “They have an RV park right on the beach and, as an retired US Army veteran, we have access to any military camping area.” With the family and the motorcycles all loaded up, they were able to have a memorable and relaxing Memorial Day weekend. Special thanks to Mark for taking the time to share his #lifeonair with us!